Serge Abiteboul , Télécom Paris, PhD in computer science, USC Los Angeles, and Thèse d'Etat, University of Paris Sud. His research is in databases, electronic commerce, document management, digital libraries, and more recently on Web data management. He is a researcher at INRIA Saclay and ENS Cachan. He has held professor positions at Stanford University and Ecole polytechnique. He is one of the co-authors of Foundations of Databases , the reference textbook in database theory. He co-founded in 2000 a start-up, named Xyleme. He received the 1998 ACM SIGMOD Innovation Award, and the 2007 Prix d'Informatique de l'Académie des Sciences. 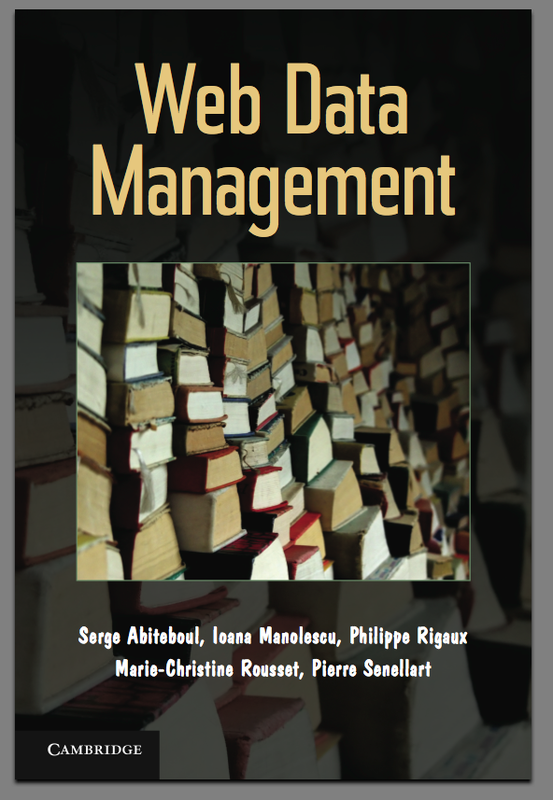 He has been awarded in 2008 an ERC Advanced Grant, namely Webdam, on Foundations of Web Data Management. He is a member of the French Académie des Sciences since 2008. Ioana Manolescu is a researcher at INRIA Saclay, and the scientific leader of the LEO team, joint between INRIA and University Paris XI. She has worked extensively on topics related to data management and query optimization, in particular in the context of XML databases, Web data management systems, and distributed data management. Her current research projects focus on peer-to-peer platforms for XML data management and cloud-based data management. Ioana has been a chair of the EDBT 2010 international conference, she is the editor in chief of the ACM SIGMOD Record, and a member of the ACM SIGMOD Executive Committee. Ioana is an author of more than 100 articles published in prestigious international conferences, book chapters etc. Philippe Rigaux holds a Master's in Computer Science from the University of Paris VII and a French Habilitation à Diriger des Recherches (HDR) from the University of Paris-Sud Orsay. He holds a position of Professor in Computer Science at the faculty of Conservatoire national des arts et métiers (Cnam). His background includes data structures, digital libraries and distributed data management. His DBLP record shows more than 50 publications in international conferences, including SIGMOD, VLDB, and ICDE. He also co-authored 6 books, including the book Spatial Databases published in 2001 by Morgan Kaufmann. Philippe Rigaux is currently CTO of Internet Memory Research, a company specialized in large-scale collection and analysis of Web data. Marie-Christine Rousset is a Professor of Computer Science at the University of Grenoble. She is an alumni of the Ecole normale supérieure (Fontenay-aux-Roses) from which she graduated in Mathematics (1980). She obtained a PhD (1983) and a Thèse d'Etat (1988) in Computer Science from Université Paris-Sud. Her areas of research are Knowledge Representation, Information Integration, Pattern Mining, and the Semantic Web. She has published over 80 refereed international journal articles and conference papers, and participated in several cooperative industry-university projects. She received a best paper award from AAAI in 1996, and has been nominated ECCAI fellow in 2005. She has served in many program committees of international conferences and in editorial boards of several journals. Piere Senellart is an Associate Professor in the Computer Science and Networking department at Télécom ParisTech, the French leading engineering school specialized in information technology. He is an alumni of the Ecole normale supérieure and obtained his M.Sc. (2003) and his Ph.D. (2007) in Computer Science from Université Paris-Sud, studying under the supervision of Serge Abiteboul. Pierre Senellart has published articles in internationally renowned conferences and journals (PODS, AAAI, VLDB Journal , Journal of the ACM , etc.) He has been a member of the program committee of ECML/PKDD, WWW, VLDB, ICDE, a member of the repeatability committee of SIGMOD, and the organizer of the SIGMOD 2010 programming contest. He is also the Information Director of the Journal of the ACM . His research interests focus around theoretical aspects of database management systems and the World Wide Web, and more specifically on the intentional indexing of the deep Web, probabilistic XML databases, and graph mining.